WARPAC or the Warsaw Pact was the Soviet version of NATO and included the Russia (USSR), Bulgaria, Czechoslovakia, Poland, Romania and Hungary. Most of the WARPAC ranges can be mixed together as Soviet units had difficulty maintaining supply so looked quite rag tag unless on parade. Soviet troops in Cold war NBC (Nuclear - Biological - Chemical) Suits. Soviet Infantry with Body Armour, suitable for Europe, Sov Bloc and Afghanistan. Soviet Infantry with camo suits suitable for Europe the Soviet Block and Afghanistan. Europe colors area mid blue green with cream blobs, tropical camo is warm bright yellow green with sand blobs. These figures can be used as Infantry scouts/RECCE, Elite Infantry, VDV, MVD, KGB Border troops, Spetznatz, Marines etc. Suitable for Western Europe all over the Sov Block and Afghanistan. During the occupation of Afghanistan the Soviet Army had a sometimes unique appearance. Mostly regular WARPC soldiers can be used with a few of these specialist packs added to give a more exotic look. 20mm Cold War Elhiem x1 Soviet Submarine Commander..
20mm Cold War Elhiem x4 Russian Soviet VDV Paratrooper Command in tropical kit, AK74s and helmets in..
20mm Cold War Elhiem x4 Russian Soviet VDV Paratrooper Riflemen in Tropical Kit with AK74s and helme..
20mm Cold War Elhiem x3 AK74 advancing in Khaki uniforms and Y strap webbing equipment. 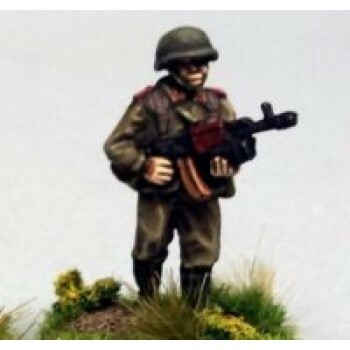 Reworked fro..
20mm Cold War Elhiem x3 Soviet Riflemen in Y strap webbing, khaki uniforms, helmets with AK74s and G..
20mm Cold War Elhiem x3 AK74 skirmishing in Khaki uniforms and Y strap webbing equipment. Reworked f..
20mm Cold War Elhiem x3 Soviet sagger crew with camo suits with AT3 Soviet infant.ry/scouts/paratroo..
20mm Cold War Elhiem x2 Soviet DHSK crew in camo suits with 1x DHSK Soviet infantry/scouts/paratroop..
20mm Cold War Elhiem x1 casualty in Khaki uniforms and Y strap webbing equipment. Reworked from scra..
20mm Cold War Elhiem x3 Soviet Command Element. Soviet infantry/scouts/paratroopers etc 1x Commander..
20mm Cold War Elhiem x4 Soviet HQ set A (Officers, Majors, General etc). Soviet Commanders in smart ..
20mm Cold War Elhiem x4 Soviet HQ set B (MP, Female Warrant Officer, 2x Officers with pistols). Sovi..
20mm Cold War Elhiem x2 Soviet in Camo AGS14 Automatic Grenade Launcher Gunner and Gun. Soviet infan..
20mm Cold War Elhiem x3 Soviet casualty. Soviet infantry/scouts/paratroopers etc. Soviets mixed up e..
20mm Cold War Elhiem x2 Soviet prone PKM team. Soviet infantry/scouts/paratroopers etc Soviets in Ca..
20mm Cold War Elhiem x2 Soviet Riflemen with camo suits snipers with SVD Drugnov. Soviet infantry/sc..
20mm Cold War Elhiem x3 Soviet SPG9 gunner with camo suits with gun. Soviet infantry/scouts/paratroo..
20mm Cold War Elhiem x3 Soviet skirmishing in camo suits with AK74. Soviet infantry/scouts/paratroop..
20mm Cold War Elhiem x2 Soviet Riflemen with camo suits weapon crews. Soviet infantry/scouts/paratro..
20mm Cold War Elhiem x2 Soviet Riflemen with camo suits weapon crews set B (foliage on helmets). Sov..
20mm Cold War Elhiem x4 Soviet Riflemen in khaki uniform with body armour and LMGs. 2x RPKs with ext..
20mm Cold War Elhiem x2 Soviet Prone PKM LMG team in Khaki uniforms and Y strap webbing equipment. (..
20mm Cold War Elhiem x4 Soviet in Y strap webbing, khaki uniforms, helmets Generic Gun Crew men. cre..
20mm Cold War Elhiem x4 Soviet Riflemen in Y strap webbing, khaki uniforms, helmets NCO pointing and..
20mm Cold War Elhiem x3 Soviet Riflemen in Y strap webbing, khaki uniforms, helmets with 1x 82mm mor..
20mm Cold War Elhiem x3 Soviet Riflemen in Y strap webbing, khaki uniforms, helmets with x1 Automati..
20mm Cold War Elhiem x4 Soviet Riflemen in Y strap webbing, khaki uniforms, helmets with field comma..
20mm Cold War Elhiem x4 Soviet Riflemen in Y strap webbing, khaki uniforms, helmets with RPG7s..
20mm Cold War Elhiem x3 Soviet Riflemen in Y strap webbing, khaki uniforms, helmets with SPG9 Recoil..
20mm Cold War Elhiem x3 Soviet Riflemen with camo suits NCOs with AK74 squad leaders commanders. Sov..
20mm Cold War Elhiem x3 Soviet Riflemen with camo suits with AK74 and grenade launchers. Soviet infa..
20mm Cold War Elhiem x3 Soviet Riflemen with camo suits with AK74 and RPG18 Soviet infantry/scouts/p..
20mm Cold War Elhiem x4 Soviet Riflemen with camo suits with AK74 with bayonets. Soviet infantry/sco..
20mm Cold War Elhiem x3 Soviet Riflemen with camo suits with AK74 with foliage. Soviet infantry/scou..
20mm Cold War Elhiem x3 Soviet Riflemen with camo suits with AK74 with webbing. Soviet infantry/scou..
20mm Cold War Elhiem x4 Soviet Riflemen with camo suits with LMGs (2x PKM, 2x RPK) . Soviet infantry..
20mm Cold War Elhiem x4 Soviets in Camo suits with RPG's. Soviet infantry/scouts/paratroopers etc wi..
20mm Cold War Elhiem x3 Soviet Style NBC troops,with AK47. Suitable for fighting in Nuclear wastes o..
20mm Cold War Elhiem x2 Soviet Style NBC Suited Command one with RPG. Suitable for fighting in Nucle..
20mm Cold War Elhiem x3 Soviet Style NBC troops armed with PK, RPK, RPD. Suitable for fighting in Nu..
20mm Cold War Elhiem x2 Soviet Style NBC Suited Specialists with 1x Sniper armed with Drugnov SVD an..
20mm Cold War Elhiem x2 1980's Russian Soviet Riflemen in Y strap webbing, khaki uniforms, helmets w..